The Lavendon war memorial forms a fitting centre-piece to the village, located at the junction of the High Street and Olney Road. A parish memorial service for Lavendon men who have been killed in action, or died as a result of service during the last war, was conducted by the Rector in the Parish Church on Tuesday. The men are Gnr. G. Sanders, R.A.; Pte. J. Robbins. Beds. and Herts. Regt. ; Pte. C. Panter, Worcester Regiment; Pte. G. Johnson, Northamptonshire Regiment; and Ordinary Seaman R. Taylor, R.N. In addition to relatives and family mourners, a contingent of the Lavendon Home Guard, of which the men were formerly members and representatives of the Parish Council, British Legion, W.V.S., and other organizations were present, were a number of Service men, home on leave from the B.L.A. and Home stations, who were school and workmates of the five men. A collection was taken for King George’s Fund for Sailors. 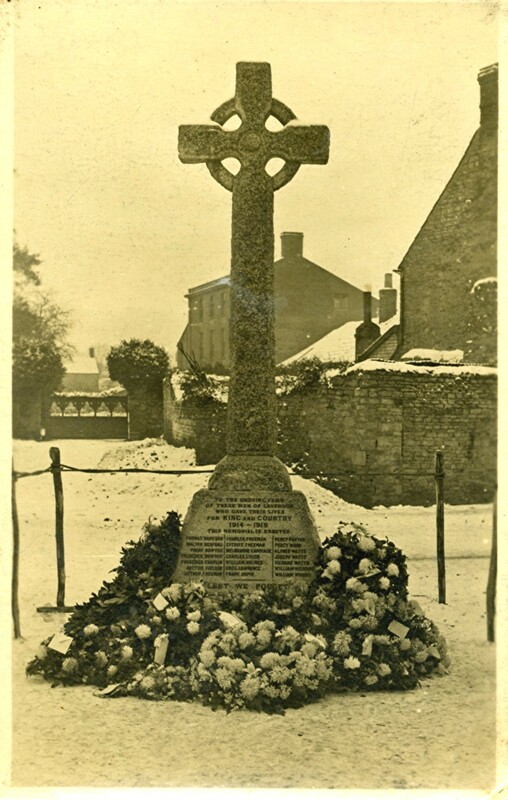 THE VILLAGE WAR MEMORIAL – Despite the bitterly cold afternoon there was a large gathering of parishioners at the junction of the Bedford and Olney roads on Sunday last when the cross of Cornish granite erected in memory of the men of Lavendon who made the great sacrifice in the war was unveiled by Major H. H. Hulse. A short but impressive service was held, and hymns appropriate to the occasion were sung. The lesson was read by the Rev. R. W. Cameron, pastor of Olney Baptist Church, and the Rev. J. H. S. Davis (rector of the parish) gave an address on the words, “Lest we forget,” which are inscribed on the memorial cross. A bugler sounded the “Last Post,” and then the ex-Service men honoured their fallen comrades by placing a wreath at the base of the cross and marching past the memorial with bared heads. Relatives and friends of the deceased soldiers also placed beautiful floral tributes at the foot of the cross. As noted above, Major H H Hulse unveiled the Lavendon war memorial and he was also largely responsible for its funding. Major Hulse was himself a distinguished soldier serving with the 5th Royal Irish Lancers during the Boer War, including fighting in the Battle of Elandslaagte. He also served during the first world war in the UK. Major Hulse lived at the Grange, Lavendon, during the early part of the 20th century. St Michael’s Church in Lavendon includes a stained glass window dedicated to his memory. To see a list of all those who died in the several conflicts as well as their tributes, click HERE or on the ‘Lavendon Soldiers’ link. For an Introduction to the War Memorial and the impact that WW1 had on the families of soldiers, click HERE. A touching work of research which brings history to life. The impact of the war to small villages such as Lavendon and Turvey must have been devastating. I have an interest in the local war history and have medals to one of these Lavendon men. Hi Matthew – many thanks for your comments. I should be very interested to learn which of the Lavendon men received the medals that you now hold. There is very little information left within the village and few families remaining who can add anything much about Lavendon’s WW1 history. I am aware of another soldier’s medals held in the village and I personally hold the medals of two other soldiers (all casualties). If you have any additional information then I would be very pleased to receive it.